New version baby thermometer. Professional, Accurate, and trusted by professionals and households. 3 Measurement Modes. Not only for body temperature test, but also can be used for object, such as food, bathwater, room temperature. 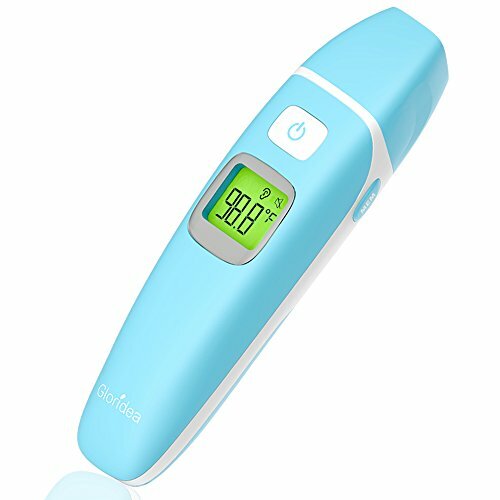 Test body temperature everyday, have a quick measurement of the milk or water in case it's too hot or cold. Helps take a good care of your baby and family. Silent Option. Easy to use and quick reading. Convenient to take your baby measurement without his/her notice. No disposable probe cover is needed. 1. Please read the instruction manual carefully and keep it for future reference. 2. Make sure no dirt is on the sensor. 3. For forehead mode, make sure there is no water, sweat or any shade on the forehead. 4. For ear mode, clean the ear canal before measurement, no cover is needed. Under power-on state,press the Memory button"MEM" on the right side and hold for 5 seconds until LCD displays "---"with"℉"or"℃" without flickering.Release the button and you will see the "℉"or"℃" flickering.Press the button again to change between "℉"and"℃". When the right signal is displayed,wait until turns off automatically. The conversion is done. If you have any questions about this product by Gloridea, contact us by completing and submitting the form below. If you are looking for a specif part number, please include it with your message.